As the clinic states itself, “Clínica las Condes is made up of a medical team committed to the excellence of the comprehensive service of its patients, with the highest safety and quality standards”. 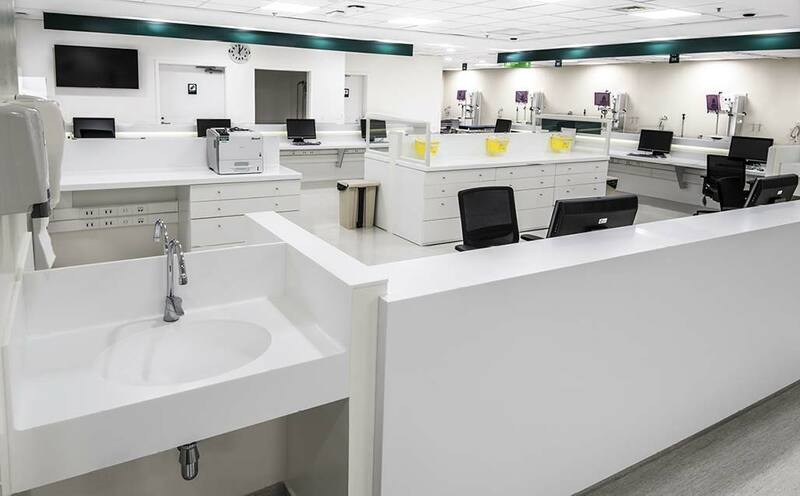 With this premise, and continuing to seek the best for its clients, PORCELANOSA Group appears with KRION® Solid Surface as the ideal material for healthcare facilities. Anti-bacterial without additives, easy to clean, non-porous, highly resistant to chemical attacks, and being 100% recyclable are some of the properties which led KRION® to be the material selected by MOBIL Arquitectos and Orlando Gatica Studio. KRION® has formed part of the project thanks to two renowned Chilean studios, MOBIL Arquitectos, who were in charge of using our material in the operating and patient recovery rooms, with work carried out by the transforming team of JV Superficies. The design and transformation of the receptions and admission rooms was carried out by Orlando Gatica Studio.